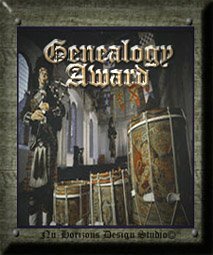 Our Web Site Awards... Nu-Horizons Design Studio Genealogy Award! We thank you for inviting us to visit your home on the Internet. We applaud your site's ease of navigation, unique graphic displays and content. It is with great pleasure that we give you the "Genealogy" award and wish you every success into the future.